My pal Tara chose this month's Barefoot Bloggers recipe, and I was very psyched to see that she chose Greek Panzanella. Last month was my choice, and I was thisclose to choosing that very recipe! I really like panzanella. 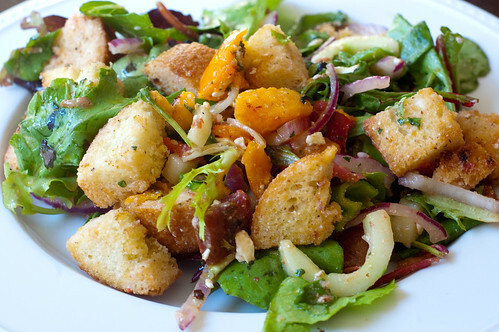 I've made cornbread panzanella and caprese panzanella, not to mention several other variations that I've never blogged. For one thing, its a great way to use up part of a loaf of bread, veggies in the crisper drawer, extra meat, etc. Anything and everything goes, and I love it! I'm also a big fan of Greek flavors and Greek salad, so I knew this would be a home run. And it was! Tons of fresh flavors and textures. The perfect summer meal. As usual, I bulked mine up by adding extra veggies, as well as by adding lettuce to the mix. I realize that traditional Greek salad doesn't have lettuce, but well, we're going out of town soon, and I'm in clean out the fridge mode. Plus, its you know, good for you. And I got to use some of the cucumbers that I'm drowning in! Win, win (win)! Heat a large skillet over medium heat with 3 Tablespoons of the olive oil. Add the bread cubes and sprinkle with salt. Stir well to combine, and toast, stirring frequently, until the bread is lightly browned and crispy, 5-10 minutes. Add more olive oil as necessary. Set aside to cool to room temperature. Meanwhile, combine all the ingredients for the vinaigrette except for the oil. Slowly stream the oil in, whisking constantly, until the mixture is emulsified. In a large bowl combine the peppers, tomatoes, onion, and cucumber. Add the bread cubes, feta, olives, and the lettuce, and toss with the vinaigrette to combine. Allow to sit at room temperature 10-15 minutes before serving. 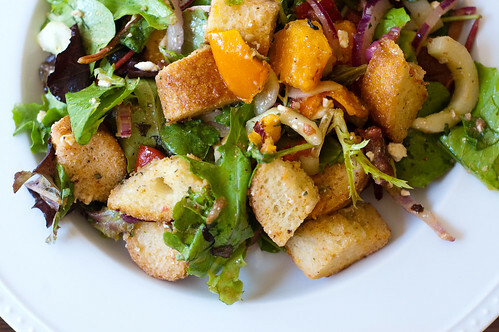 I have been looking for a good panzanella recipe for so long and I think this just might be the one...it looks delicious!